...About 18 miles above the mouth the river is crossed by the county road on a drawbridge, just below which is the town of Ballew, the only post-office. The place is the present head of navigation and the only river landing in use. The river is navigated at present for 18 miles, and is navigable for 30 miles. It has been navigated by small craft for 75 miles, and were it not for the overhanging timber the vessels now trading in the river could navigate it for the whole distance. The products shipped at present are garden truck, cotton and cotton seed, hay, etc., and in event of the improvement of the river all kinds of farm products would be shipped, together with cattle, hides, horns, etc. 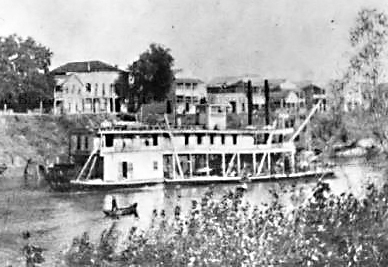 The 'Alice Blair' docked at Front Street, East Columbia. Image courtesy of the Brazoria County Historical Museum. There are six vessels trading regularly in the river at present, carrying cotton and cotton seed to Velasco and Galveston, returning with groceries and household supplies. Owing to the shifting quicksand bar at the mouth of the theses vessels are often obliged to await favorable weather and time to cross the bar, both going and coming. Sometimes this delay is only a few hours, and again it is days, and there are cases on record where the delay amounted weeks, for when the Gulf becomes a little rough the breakers sweep across the narrow channel, making it impossible to steer a vessel either in or out. This bar has the name of being one of the most dangerous on the Texas Coat, and any improvement that would give anything like a permanent channel would be thankfully received and would result in increased activity among the coasting fleet and a full development of the lands adjacent and neighboring or tributary to the river.